Part IV Military-installed caretaker govt, or a 'consortium' govt? But let me return to the central question: is it reasonable to claim that western governments were directly involved in the consortium project? That they were, as I argue, not only one of the constitutive elements, but the leading one? 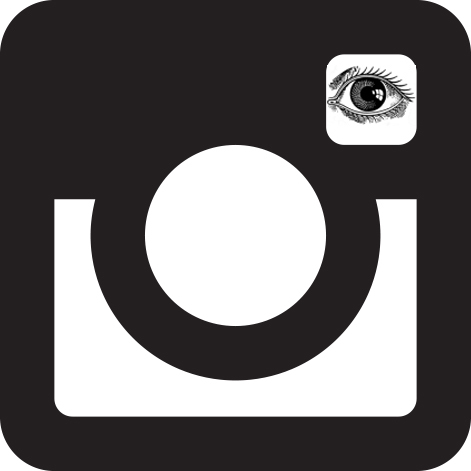 Some may reply that the presence of the Coffee Group (generally known as the “Tuesday Club”), the frenzied activity of its members prior to the consortium coup, and after — settles the matter. That, the evidence of their activities is well-documented in both print and electronic media, that it is considerably strong, and that convictions on the basis of far less circumstantial evidence have been awarded by courts of law, ones that enjoy credibility. 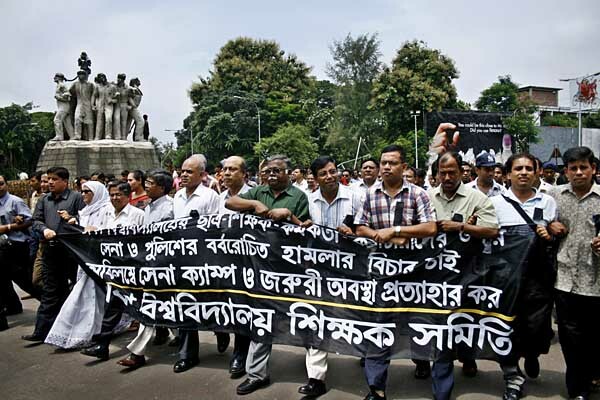 Author Shahidul AlamPosted on March 1, 2012 Categories Bangladesh, Caretaker government, Consortium government, Democracy, Elections, Global Issues, Governance, Imperialism, Military, politics, Rahnuma Ahmed, South Asia, war on terrorTags Bangladesh carektaker government 2007, Butenis, Consortium Government, Daily Star, Fakhruddin, foreign interference, Global issues, politics, Rahnuma Ahmed, Renata Dessallien, Student protests, Tuesday Club, UN Peacekeeping forces, UNDP, war on terror, Western diplomats, WikiLeaksLeave a comment on Part IV Military-installed caretaker govt, or a 'consortium' govt? Singapore Airlines warned of “protests by university students developing in Dhaka” as we boarded the plane. But emails from Delower and Rahnuma during the brief stopover in Singapore talked of the curfew in place in the six main cities. 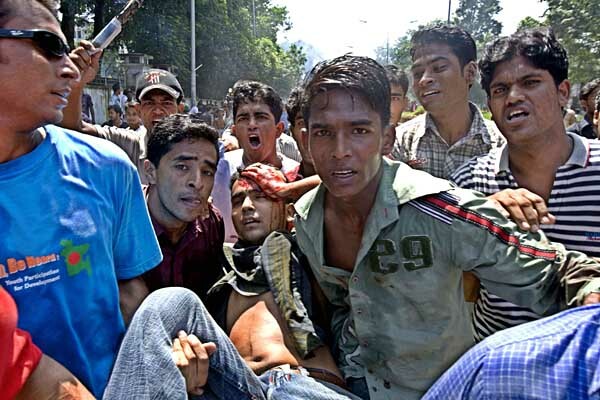 This was no longer a small skirmish in Dhaka University. Joshim was going to be at the airport with my accreditation card and we would try and find a way back home. 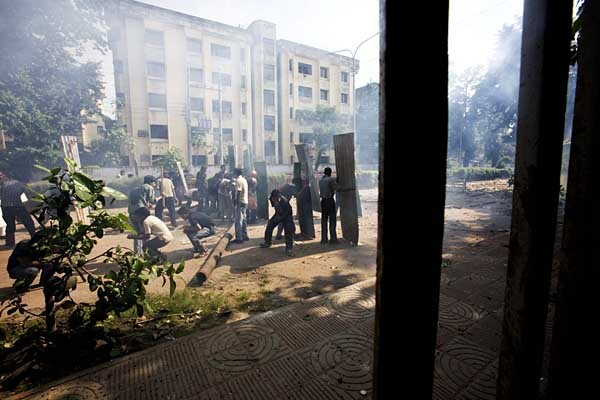 Students at Dhaka University shielding themselves with sheets of tin, during fights with police. Photographer anonymous. 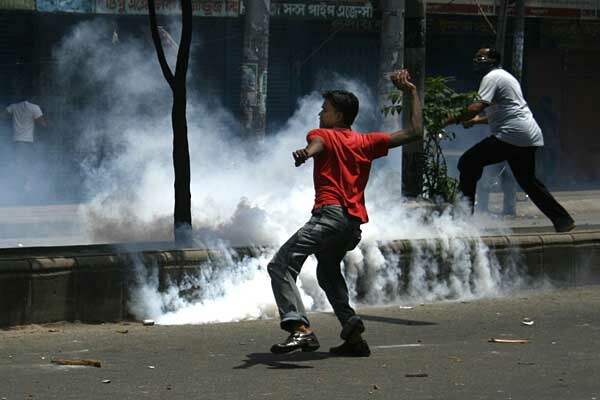 Protesting students gather at Dhaka University campus during violent clashes with police. Photographer anonymous. Student hit by police shotgun bullet being carried away by fellow students. Photographer anonymous. Enraged students burn a car at the Teacher’s Student’s Centre (TSC). Photographer anonymous. The government had taken all mobile networks off the air. With only official press releases for information, the person in the street was in for a rough time. It was easy to find Joshim in the empty car park. Only the occasional long distance truck plied VIP road. I put the video camera on record mode, but relied on my less conspicuous LUMIX to photograph the empty streets. Though I stopped on the Mohakhali flyover to take pictures, I was nervous when the RAB vehicles passed below. There was never a good time for being arrested, but this was as wrong a time as it could get. Aaasteeey! The policeman strode over lazily. Ki bapar? I did have my card dangling from my neck, and from previous experience, used my confident, ‘I belong here’ approach. That usually worked best with low tier security people. I’d stopped to take pictures by the near-empty Tejgaon rail station. Stepping carefully through the people sleeping on the floor, I came up to Shahjahan and Neela. 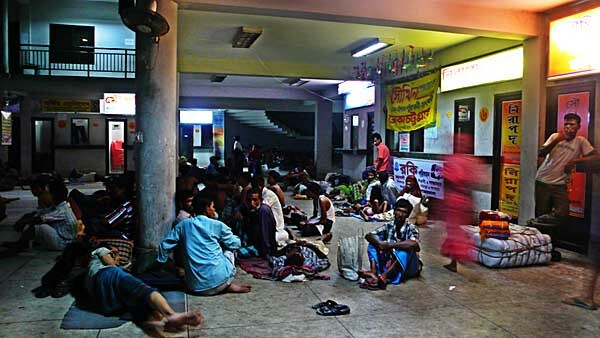 Unaware of the curfew, they had brought their sick child Shamim from Tangail, but got stranded in Tejgaon. There was no food, no doctor, no place to sleep, no way of knowing how long this would go on. Each visit to the toilet cost 5 Taka. The next checkpost was slightly more hostile, but the expired accreditation card dangling from my neck was working overtime. We passed without much harassment. 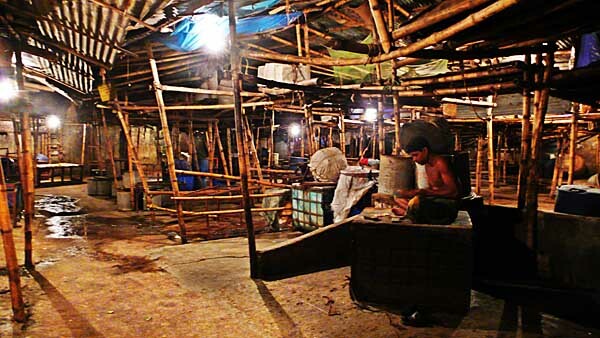 Dropping Joshim home, I went past the Shonar Bangla Market in Karwan Bazaar. The busy market place had a haunted look. No cackle of chickens, haggling for prices, or calls from vendors. Just one man counting loose change. 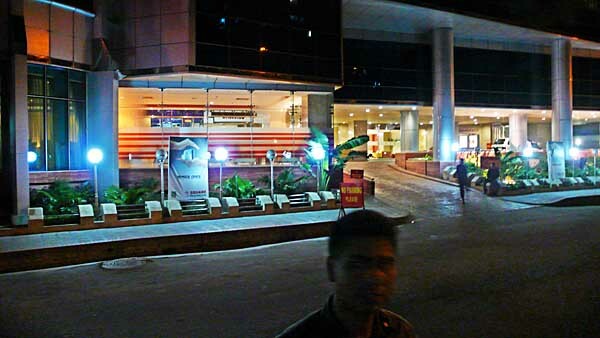 The brightly lit Square Hospital in Panthapath stood out in the dark. 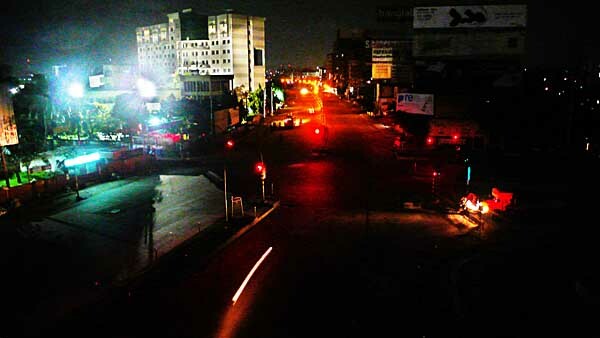 Government orders to turn down the lights after dusk to save electricity was presumably for commoners only. The street was empty, but this time as I approached with my camera police converged from all directions. I fumbled a bit, but recovered in time to get one shot. This was not the time to look for best angles. Rattling off important sounding words like ministry of information, and dropping the occasional names I could think of, I got into the car and drove off before the uniformed men had gathered their wits. A government adviser’s business interests in Square Pharmaceuticals – while undeclared – was well known. Students had already attacked the building the previous day. The approaching police knew whose business interests to protect. The road through Dhanmondi was eerie. 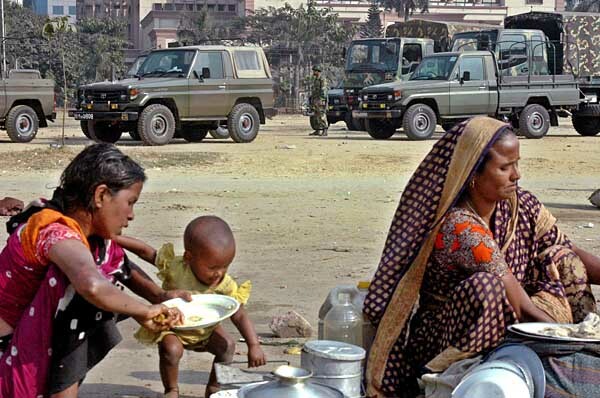 The women who walked the streets near Abahani playground were nowhere to be seen. Like the many others who struggled to make a living, they too would not be earning tonight. The junction near ULAB was scarred by burnt tyres. The convoy of police vans deterred me from getting my camera out and I turned into road 4A. It was time to go home. Kamaler Ma, Joigun, Zohra and Rahnuma were all up waiting. With the mobile network off, they didn’t have any news about me. There must have been others in many more homes who were up worrying. 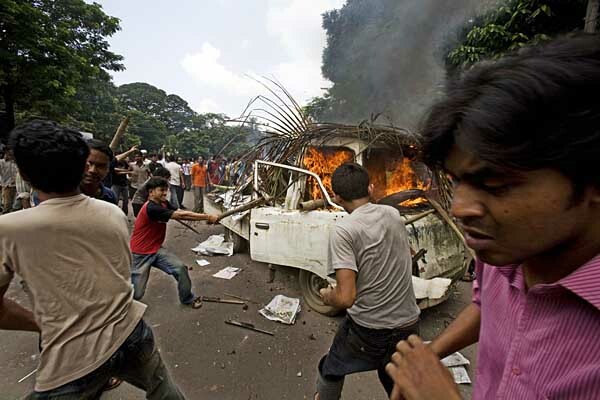 Rahnuma and I talked of the events over the last two days, of the army camp in Dhaka University. Of a soldier slapping a student. Of the vice chancellor (acting) being beaten up by police. This had never happened before, not even during the Ayub or Ershad military regimes. The reference to ‘evil doers’ in the chief adviser’s speech to the nation was worryingly close to the ‘axis of evil’. 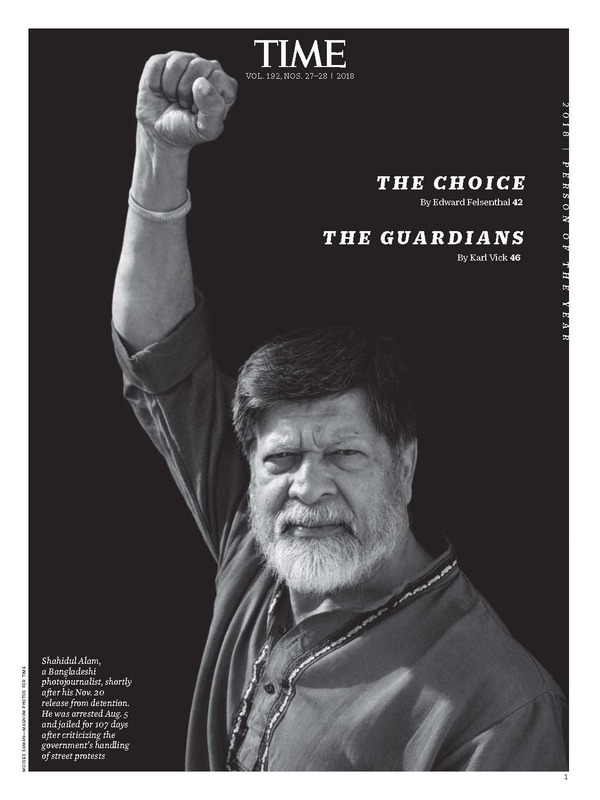 Independent media channels were then still defiant. That night the information adviser advised the media to practice ‘self censorship’. Despite their claims, this government had never been called in by the people. We had no say in who the advisers would be. It was not military rule the people had welcomed, but the cessation of violence and the fear of further anarchy if the rigged elections were held. Banana trees would have made equally good replacements. However, banana trees would not have sold national interests. Closed down environmentally-friendly jute mills. Made slum dwellers homeless, or tortured and killed adibashis protesting the military acquisition of their ancestral lands. So while there was initial relief, as the price of essentials soared, news of nepotism and the partisan manner in which Jamaat -e-Islami was being shielded soon made people realise this banana tree would never bear fruit, let alone run a government. Warrantless arrests by plainsclothes army under the cover of curfew. Dissenting teachers picked up in the middle of the night. Making threats to independent channels ETV and CSB are hardly the character of a saviour government pledged to the return of democracy. As the behind-the-scene military decides it will now take centre stage. 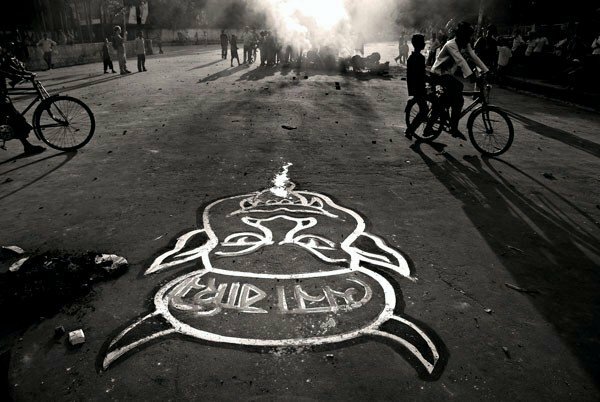 As Bangladeshis realise that a democratically elected autocratic government has simply been replaced by an unelected autocratic one, the tune in the streets is changing. 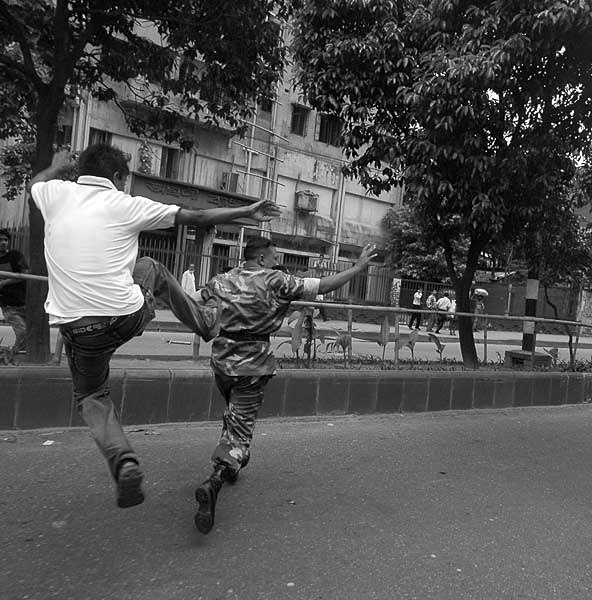 “In unprecedented scenes, soldiers in uniform were seen being chased out of the Dhaka university campus by students. In two days, the myth of the army’s omnipotence was all but laid to rest.” BBC. Photographer Anonymous. The US has declared support for the chief adviser’s statement. What he lacks is the support of the people.